A hugely successful mistake! We created this recipe out of necessity when a different batch did not go as planned, and we love the result. Named for Joyce's Ulysses, the Bloomsday is firmer than many of our cheeses with a cheddary acidity balanced with a touch of sweetness. Bloomsday is a perfect addition to any cheese plate and it makes a delicious sandwich or grilled cheese. An excellent substitute for medium cheddar or Spanish Manchego, Bloomsday is one of our most popular cheeses! Pairs well with fig jam, sour dough bread, medium bodied red wines, and amber lager. Aged 6-7 months. AWARD WINNER! Hooligan is our signature "stinky" cheese that many food lovers consider to be our most exciting variety. Hooligan was awarded the top prize in the Outstanding Dairy category from Gallo Family Vineyards Gold Medal Awards (April 2006), and it was selected by both Saveur magazine and Slow Food USA as one of the top American cheeses. Made in 1.3-1.5 lb wheels and aged for 60-75 days, Hooligan is a ripe washed-rind cheese with a soft creamy paste, slightly firmer center, and a gorgeous orange rind - with a flavor reminiscent of French Muenster. Hooligans are bathed twice a week in brine to encourage the growth of pungent, surface-ripening bacteria and yeasts. The Hooligan melts beautifully for a fabulously stinky toasted cheese. Pairs well with cranberry walnut bread, Belgian style ales, Zinfandel, sweet white wines, hot pepper jelly, honey, and caramelized pecans. Our Trappist-style monastery cheese with a creamy texture and slightly acidic aftertaste. Bridgid's Abbey is one of our oldest recipes, going back to a workshop Liz took with a Belgian cheese master in 1997. Its creaminess is balanced with a milky lactic acidity for irresistible eating for breakfast, sandwiches, or snacking. We now make Bridgid's Abbey only during the winter months to highlight the richer winter milk, higher in delicious butter fat and protein. Aged 2 - 4 months. Our Aged Bloomsday is 11 - 12 months old for a sharper and more intense finish - think a cheddary bite that's balanced by a touch of sweetness. This is a classic aged cheese that is a fine addition to any cheese plate, Aged Bloomsday can take the place of cheddar or aged Manchego. Aged Bloomsday melts beautifully on top a burger or in grilled cheese, and it makes a perfect partner for full flavored wines like California Petit Sirah. Also pairs well with fig jam, honey, stout, and a Double IPA. Watch for our "Anniversary Edition Bloomsday" to be released every June 16th. Inspired by the classic Spanish sheep milk cheese Manchego, our cows' milk Womanchego is aged 3 to 5 months, making it more similar to a young Manchego than the aged version most commonly found in cheese shops. The flavor is medium mild and a touch sweet with hints of fruit and nut. Moister than its Spanish cousin, our Womanchego is a versatile partner that is delicious on sandwiches or melted - it's our favorite cheese for tortillas! Womanchego pairs with medium red or white wines and honey-brewed ales and is delicious on a water cracker with a cranberry chutnet. On limited occasions we will offer our Mrs. Robinson, aged at least 7 months, or Wise Womanchego, aged for at least one year. Dutch Farmstead features a milky flavor, light acidity, and a richness that highlights the buttery quality of our Jersey milk. It is a delightfully versatile cheese! Its young age allows it to pair well with sauvignon blanc or tart raspberry jam, while its rich texture stands up to inky cabernets and floral saisons. A natural rind blue with a gorgeous yellow color speckled with blue. Moderately creamy and medium strong with a rich, slightly earthy finish. Distinctive but accessible, our Black Ledge Blue works well on salads or sandwiches, and it melts nicely on burgers or steak. We use only gluten-free blue mold and age the Black Ledge Blue for 2 - 5 months. Pairs well with honey, pears, glazed walnuts or pecans, dark bread, sweet dessert wines, and porter or stout. A customer and staff favorite, Dairyere is a firm washed rind cheese in the style of Alpine varieties like Gruyere or Comte. We age our 25 pound wheels for 7-8 months to produce a well balanced cheese with a medium sharp bite and a delicious nutty after taste. Dairyere is fabulous snacking cheese to enjoy with a crusty sourdough bread, Italian soppressata, and a glass of Merlot or Connecticut's own Broad Brook Ale - or you can melt it for fondue or grilled cheese. Made with vegetarian marzyme rennet. ACS AWARD WINNER! 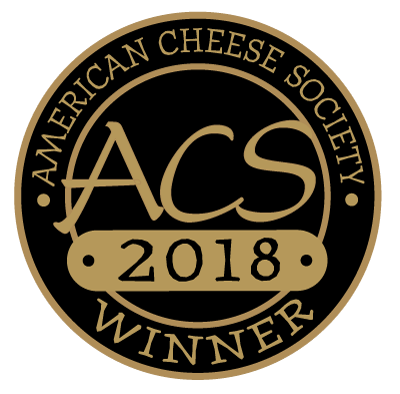 Second Place Winner at the 2014 American Cheese Society Competition in the Farmstead category; Third Place in 2011 & 2010. Dairyere Reserve is aged 12 months or more for a drier, more granular consistency than our Dairyere. With a nutty flavor, medium bite, and sweet caramel-like after taste, it's hard to put down! Made with vegetarian marzyme rennet. Limited availability throughout the year. Fromage d'O'Cow - Hooligan's "bigger brother" is made in flat, five pound wheels and washed regularly with brine to encourage the growth of pungent, surface-ripening bacteria and yeasts. The wide surface area helps these microflora penetrate quickly throughout the cheese, leading to greater ripeness and intensity. Rappleree (pictured here) is formed in the same disc shape as the Fromage d'O'Cow. Once in the cave, we rub it with apple marc from Connecticut's Westford Hill Distillery. The apple lends a unique fruitiness and added pungency to the Rappleree, making it most often our stinkiest cheese! Our young Vivace is sweet, chewy and moist, a medium mild cheese with a flavor like Swiss Emmental. It is excellent for sandwiches, antipasto, or melting - and it's accessibility makes it perfect for both kids and the young-at-heart. Vivace Bambino is aged 2 to 3 months. (Vee vah' chay) Like a combination of Emmental and Italian Provolone, our Vivace has a supple texture with a medium bite and aromatic finish. Vivace is a perfect snacking cheese that is addictively easy to eat! We recommend enjoying Vivace and rye bread with Italian lunch meats and a glass of Chardonnay, Pinot Noir, or pilsner. The cheese also melts beautifully in cooking - try this in French onion soup or fondue! Aged 4 to 6 months. Join us around the holidays for limited releases of Molto Vivace, 12-14 months old with a dry texture and super sharp bite. Cornerstone is our first native cultured cheese! Made in collaboration with Parish Hill Creamery in Vermont and Birchrun Hills Farm in Pennsylvania, Cornerstone is an exploration of American terroir. Each of the three cheesemakers follows the same recipe to grow our own starter cultures and make a tomme-style cheese. Cornerstone purely expresses the rich raw milk of our cows, the land they feed on, and the unique environs of our aging cave – in essence, Cornerstone represents everything that goes into our farming and cheesemaking practices. Cornerstone displays distinct character from batch to batch, as the qualities of the milk shine through. It has a toothsome, supple texture with hints of yogurt and apple. Batches aged closer to a year develop deeper herbal notes. This aged version of the Vivace has transformed into a sharp, dry cheese with a tremendous bite. It is assertive with a delicious combination of fruitiness and nuttiness that balance the tongue-tingling aftertaste. Molto Vivace is firm enough to grate, or enjoy it with fruit or wine. Aged 10 months or more. Made with vegetarian marzyme rennet. Limited seasonal availability, usually around Thanksgiving. An English style cheddar, wrapped in muslin and aged for 10-12 months or more. This classic cheddar is medium sharp and complex with an after taste of apple and nuts. True to its style, Jeremy River Cheddar is drier and not as sharp as some Vermont or NY cheddars, highlighting instead the breath of flavors that give it balance. Available intermittently throughout the year (we make 3-5 batches annually). The Culture Magazine centerfold cheese, Winter 2015! Despearado is made like our Hooligan and then washed with fermented pear mash and Pear William eau de vie from Connecticut's Westford Hill Distillery. The effect is a unique cheese that's stronger and riper than our traditional Hooligan with a hint of pear on the aftertaste. Aged 2 months and sold in whole 1.4 pound wheels. Other variations on Hooligan include Drunken Hooligan (washed in grape lees from Priam Vineyard) and Drunk Monk (washed in beer from Willimantic Brewing Company).